Cameron Schwab is an experienced CEO, leadership coach and organisational specialist. He works with Boards, CEOs and executive teams, as well as coaches and coaching teams, to build leadership capability, particularly as it relates to organisational performance and transformation. He has been a leader in the dynamic, heavily scrutinised and multifaceted professional sports industry for over 30 years in the major Australian sporting competition, the Australian Football League (AFL). His leadership career commenced at just 20 years of age, overseeing talent identification and player recruitment at the Melbourne Football Club. He was appointed CEO of the Richmond Football Club at age 24, the youngest in the history of the AFL. For the next 25 years, he was CEO of three AFL clubs, Richmond, and the Melbourne and Fremantle clubs, ranking him in the eighth longest serving CEO in the 150 years of the sport. He was also CEO of the AFL’s Official Website, www.afl.com.au. Cameron’s expertise centres on performance turnaround through strategic renewal, innovation and commercial enhancement by building organisational capability and creating clarity of focus. He is a positive and creative thinker and communicator with highly developed strategic skills, and a track record of unifying organisations whilst navigating periods of genuine adversity and change. He holds an MBA and Master of Marketing from the Melbourne Business School. He has also completed the Advanced Management Program (AMP) at the Harvard Business School, as well as the Harvard program on Board Effectiveness. He is a Vincent Fairfax Fellow of the Centre of Ethical Leadership (CEL) at University of Melbourne. Football has always been a major part of my life I grew up as a fanatical Richmond supporter. My father Alan Schwab was the secretary (now called CEO) of the club during their great success era of the 60s and 70s. I then went on to spend the best part of 30 years working in the game, with almost 25 years as the CEO of three AFL clubs, Richmond, Melbourne and Fremantle, returning to Melbourne twice. I was only 24 when I was appointed General Manager (now CEO) of Richmond in 1988. Unfortunately, the club was not in nearly the same shape as when my father left a dozen years earlier. The club was technically bankrupt and last on the ladder, so there were many challenges to overcome. There was probably no amount of experience that would have prepared me for the role; however, to the credit of the President Neville Crowe, they never treated me as ‘young’. I was not only young in age, but was also young-looking, dealing with much older people, including the players themselves, many of whom had been my childhood heroes only a few years earlier. Whilst I would not change this experience for anything, I also would not recommend becoming a CEO at such a young age. I learnt early in my career the value of innovation and being prepared to push new ways of doing things and fresh ideas. My first ‘serious’ job was as Recruiting Manager at Melbourne Football Club. Again I was young, only 20. Few clubs had full-time recruiters during this era, and the fact I was young – and cheap – played a big part in getting the role. I was one of the first to utilise video for player selection. This was born out of necessity. Melbourne was struggling financially and we couldn’t afford to catch flights to watch games around the country. I also realised I could watch 5-6 games from my office, make notes, follow up and save the flights to watch players I had seen many times on tape. I then grew confident in my knowledge, which was important when having to make recommendations on who we should recruit to people such as the legendary Ron Barassi, who was Melbourne’s senior coach at that time. He is a remarkable man, and always listened intently and backed my judgment. I think he was confient that I’d put in the work. This was an exciting time. Melbourne made the finals for the first time in almost 25 years and I’d been involved in the recruitment of many of the players who went on to have great careers at the club. One of the most misunderstood concepts in football is the way in which you balance the business/commercial aspects of the club, with the need to win games. AFL clubs are subjected to three layers of constraints; Firstly, their location, in particular the number of competing clubs and appetite for the game in their State, secondly the historic size of their supporter base and their capacity to commercialise it via their stadium arrangements, and finally the constraints the AFL impose to ensure competitive balance, such as player drafts and salary cap, as well distribution of funds from broadcasting, sponsorship, ticketing etc. These constraints effect not only your Profit Model, but also impact what we call the Premiership Model, the capacity to build a successful football team. There are many trade-offs between the two models, and the more constrained your club, the more challenging this is. This leads to very interesting debates as to whether you put on another commercial person in the hope of growing revenue or another player the coach thinks will make a difference. As CEO, you need to equip yourself for this type of decision making. Football attracts very strong personalities, and also people who have been very successful to this point in their lives. For example, most players arrive at the club as the best player and the hero of their local team. To get into the system they have been forced to take a very single-minded, if not selfish approach to their careers. It can then be a big challenge to educate on the value of selflessness, to commit to a team culture and the understanding that without this you cannot beat the teams who have committed to this ethos. The first thing you try to do as a leader is a give a sense of hope, a powerful vision and means by which it can be achieved. Football clubs more than any other business need this because it is the visible performance of the team which drives member passion and support. Football clubs demand and receive an emotional connection from thousands of people - its members. That must be respected, and deeply. It is part of a person’s identity. The club they support is in most cases, a lifetime relationship. I was appointed CEO of Fremantle in 2001. The club entered the AFL competition in 1995, but already had a debt of $8M and never finished higher than 12th on the ladder. They had finished last that season, losing 17 games in a row, the coach had been sacked mid-season and the captain had stepped aside. Within weeks of me starting, the very people who had appointed me into the role, including the President of the club, resigned. The Board was being criticised in the media for a number of decisions that it had made since its inception, including my appointment as CEO, even though I had been in the job for about 10 days. I remember ringing my wife and questioning whether I had made the right decision to take the job, and whether this was a good call for us as a family given they were going to have to relocate to the other side of the country. I was sitting alone in a hotel room with no friends, no coach, no captain, underperforming footy team, a big debt and lots of serious questions being asked about whether Fremantle deserved its place in the AFL competition. But in my briefcase I had an AFL report from a few years earlier with all the thinking behind Fremantle’s introduction into the competition. I realised all the conditions still existed, the support just hadn’t been mobilised. We needed to give Fremantle people a reason to love their footy club. Fremantle has a rich sporting tradition, but which was probably not as well-known outside of WA, but it hadn’t expressed itself through its most recent football incarnation, the Fremantle Dockers. We started to focus on the very things that made Fremantle football great, embracing the ethos Fremantle people expected. Firstly, we committed to making our home games memorable for our people. The club had won only one game at home the previous year, despite a very significant home ground advantage. In the first year (2002), we won 9 out of 12 home games. The crowds started pouring in, the experience of watching us win and then going home to celebrate with their friends. This then started to give us hope, and with players such as Matthew Pavlich, Peter Bell, Jeff Farmer, Luke McPharlin and Aaron Sandilands in our team, who were all great to watch. The momentum developed from there into what turned out to be the best 7 years of my working career, with Fremantle playing finals for the first time, getting to within a game of the Grand Final, and playing to sell-out crowds every week. I think there is a great attraction as a CEO to go into an environment which is considered to be in crisis. Immediately, you are going to be part of the new way. When you are in this situation, people are willing to embrace change. But you need to make visible progress, so you do not revert back into crisis. Fortunately, at Fremantle we were able to build momentum and maintain it. The danger is that expectations can build more quickly than the capability of the organisation, and you run the very real risk of overpromising on inflated and perhaps unrealistic expectations. I have been guilty of this as CEO, allowing myself to be caught in the momentum. That is a regret, no doubt. In my career, I have spent a lot more time losing than winning partly due to the circumstances of the clubs when I started in the roles, and as much as you get better at reconciling winning and losing as you get older, losing is still the hardest part of sport. When I was at school I did not have a clear ambition for my future, but I did have a passion for art, mainly drawing. My mother is an artist and she tells me that I was always drawing and making things as a young kid. During my final years of school drawing became very unfashionable in the art world, with the rise of abstractionism and other art movements for which drawing played no role. This might be the only time in art history where drawing was disrespected. This threw me a little, my artistic confidence suffered, and I didn’t apply to do art post Year 12. Quite ironically, in an era when we can replicate things digitally and have even more technology, drawing has become popular again and is now seen as a fundamental of the art world. There was a job advertised in the paper for an office boy at the Melbourne Football Club mid-way through my Year 12. I got the job, no doubt due to my father’s influence. ‘Schwab’ was a very handy surname in those years. Six years later I was a CEO of Richmond. Given my interest in art and sport, I had not done one accounting or business subject at school. With the support of Richmond, I completed a live-in Advanced Management Program (AMP) at the Melbourne Business School. This opened my eyes to so many things. Firstly, I realised I could compete with people at that level who had gone through formal university level education. My CEO experience and learning was invaluable. Having got to know some terrific people at the Melbourne Business School, I then set myself to do an MBA, something I would never have dreamt was possible given my lack of university study. After doing a few tests, I then embarked on an Executive MBA, which set me on a path of learning both formally and informally, an attitude and behaviour that I have maintained ever since. I had always enjoyed reading, but from my Masters I learnt how to direct my thinking and how to be more strategic in my learning. I enjoyed the experience so much, that I did a Master of Marketing immediately post the MBA. I then re-entered the workforce armed with two new masters degrees that I completed in just a few years full-time. I really enjoy immersive and intensive learning, which I received at the MBS. This was the start of my love of education and several years later I went on to complete the Advanced Management Program at the Harvard Business School and a Coaching Certification Course at the Columbia Business School in New York, all stemming from my experience at the Melbourne Business School. I have since gone back to university to follow my first passion, art. Last year I completed my first year of a Fine Arts Degree at the Victorian College of the Arts (VCA), mainly portraiture and figurative drawing. I also did a year at the NCAT, to put together a folio so I could get into the VCA, which was a great experience and proved to myself that I do have a love for drawing. As part of my approach to coaching I encourage everyone to ‘find a creative space’. Recently I had a conversation with Kevin Sheedy about his creative space and he started showing me photos on his phone of the garden that he has created at his home and sharing with me his knowledge of all things flora. He shared with me that it was in his garden that his best ideas came to him, where he actually picked premiership winning teams. Very cool. I now wonder whether I enjoy art as much as I did before, given now that I have an expectation attached to it which I did not have when it was only an escape. I have realised that I can then have other creative spaces where I can experience this escape, free from expectation. It does not have to be a traditional concept of ‘creative’. For some people this space doesn’t exist in art or in gardening but may be as simple as going for a walk or listening to a podcast. In many ways the world of art is ahead of the world of business around the concepts of identity, purpose and story-telling, which have been part of the language of art for centuries. I was sacked as CEO of Melbourne in the late 90s. The club had almost merged in 1996 with Hawthorn, but the Hawk supporters voted against the merge. As a club, Hawthorn’s response to this near-death experience was a total rebuild of the club. They had been Premiers only 5 year earlier, so a total reshape was a courageous call. Melbourne, who had not won a Premiership since 1964, were considered the stronger partner in the proposed merger as the predominantly Melbourne jerseys reflected. I was appointed shortly after the failed merge. The club was very fragmented. The Board who I reported to was made up of two factions, pro and anti-merger. The following year we unsurprisingly finished at the bottom of the ladder, however the next year we fell just one game short of making the Grand Final. It was a satisying year for the club but it also set very high expectations. The next year we dropped off and were just a mid-range team, clouded by the fact that the club went to the AFL to confirm it had been paying outside of the salary cap for many years. It was fair to say that I did not have a great relationship with the President of the club at the time, ending in me being informed through the media that I had been sacked as CEO. At this stage I was in my mid 30s, had already had two CEO roles and like many men of that age, I had been defining myself by what I did in terms of my work and for which I saw little future prospect. This became a very difficult time of my life; I isolated myself in many ways. Of the few football people I kept in contact with was Allan Jeans, the famous coach of Hawthorn, St Kilda and for one year, Richmond when I was GM. Whilst we had only worked together for a short-time, we became close. His phone calls were the only ones I would regularly take. “It is not about how you get knocked down, it’s how you get up”. He repeated it three times, holding my gaze. I wrote this down on my table placecard. This was the spark that got me going again, I started digging myself out of the place that I had allowed myself to sink to. I started writing ‘Finding Something’ on my notebook and I still do this every day of my life. When I give talks now I open with this phrase and go on to tell this story. It was such generous and thoughtful leadership and mentoring by Allan, who took me to this event knowing that he had a message that he wanted me to hear in a meaningful context. This single event probably changed my life. I have learnt a lot about giving advice. I now reflect that in the past my advice was too often motivated by what I wanted, mainly as it related to the role I was playing as CEO, but also ego. When I did the coaching program at Columbia, I realised that this was the type of learning I should have experienced at the start of my career. Giving advice needs to be much more than conveying a want. My advice is simply, if you do not trust yourself at a fundamental level, then you cannot give or build trust. To build trust as a CEO is one of the most difficult parts of the role. I have kept a notebook over the years. I prefer a notebook to a diary as you are not constricted in terms of space. It allows me to write down ideas that come to me during a conversation or when reading a book. I now have many years’ worth of these notebooks - some of them I’d rather not read! By writing these principles down, it allows me to restart each day. As much as I am a fan of technology, there is something special about the tactile and mindful appeal of high quality paper and a special pen. For me it is the pen that I gave to my father for his 50th birthday. I usually write just before I leave for work in the morning or first thing when I am in the office; such a meaningful exercise only takes around 10 minutes each day. My favourite quote is from Allan Jeans, ‘Your first loss is your best loss’: if it’s not going to work, face up to it, deal with it and move on from it. 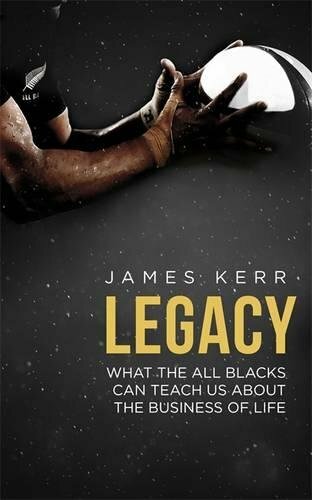 I love the book Legacy by James Kerr, which is fundamentally about the New Zealand All Blacks, but you don’t need to have a love or passion for sport to get a lot out of this book. The story which comes to mind is the All Blacks mantra ‘Sweep the Sheds’. It is an exercise in humility in which the players stay behind after a game, complete the post-game routine and when all the external people have left the change room, the players clean the rooms - the idea being that they created the mess therefore they should be the ones to clean the mess. It is about bringing them back to their reality, a reminder to not let ego get ahead, as well as providing the team with a regular opportunity to just be together. I have probably purchased and given 80 copies of the book away as I have wanted to share its message with so many others. I am now moving towards running workshops with CEOs focusing on the concept of building trust within their organisation based in part on my own reflection and experiences as a CEO who has been in roles where trust has existed and where it has not existed, and my role in this. I have then looked at these experiences and asked myself what a course would look like that I could have done to equip me with the skills needed to build that trust. From this I have put together 2-day workshops exclusively for CEOs centred around how they build trust at a personal level as well as culturally and strategically, whilst being able to recognise the threats to that trust. It is then about building a trust plan, so that for example if they undertake the workshop on a Friday and Saturday, they can then go into the office that Monday and make it happen, in a way where people are not threatened by the sense of change. The workshops have not started yet, but I look forward to notifying everyone once they do.